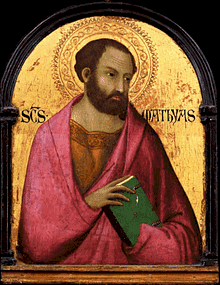 St Matthias was an Apostle appointed not by Jesus but by the remaining eleven apostles, to replace Judas Iscariot who had betrayed Jesus. St Matthias first preached in Judea and then Aethiopa, Georgia. Like many of Jesus’ disciples, he was martyred, by stoning, for his preaching and teaching. The Feast of St Matthias is the 14th May. Pray for us that we will come to understand and fulfil the life Jesus asks us to follow.